GaryO (Gary Olivas) has been involved in music for most of his life. Having started playing guitar and drums at a very early age, he has honed his musical skills throughout his career and is making his mark in the music scene, in and out of the Denver area. 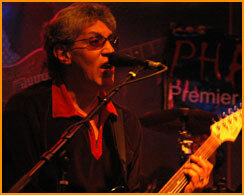 Having toured with several artists including legendary Jazz pianist, Gene Harris, Blues singer Hazel Miller (of Big Head Todd fame), and others, GaryO has been perfecting his guitar and songwriting talents with that trademark sound of Jazz, Blues, R&B, and Pop/Rock all rolled into his own unique style. GaryO is currently working with Denver's hottest R&B/Dance band, PHAT DADDY. He continued his recording career with his follow-up CD, "IT'S LIKE THIS ", released in 2009. His third CD, "SIX STRING DRIVER" was released in 2012. "ROUGH MIX", GaryO's first release, is still available on our TBD label. All his CDs can be purchased on this website. His newest and fourth CD, "STRUTIN", is available now in 2015. Listen to music clips from GaryO albums here. GaryO is also involved with streaming media by way of the hugely popular online games Second Life® and Inworldz™. As Ganjo Mokeev (GaryO's avatar name in the games), he does live shows regularly at venues throughout Second Life® and InWorldz™. GaryO (Gary Olivas) is a professional musician in the Denver, Colorado area. He is a singer, songwriter and guitarist. He also streams live music performances into the massive multi-player online games Second Life© and InWorldz™ under the avatar name of Ganjo Mokeev. His musical styles range from blues, R and B, funk, jazz and rock. He plays his original songs and originally arranged covers.